I feel the T was boring the early 2000s. You could only find RTS buses. The rapid transit lines had no older or new equipment. The Green Line had the drama of the Type 8s, and you could still ride a Boeing. I think the disappearance of so many pieces of history in a relatively short time is what did it for me. The original Boeings were always interesting to ride, and the re-builds were never quite as exciting. I also fogot about the elevated Green Line along Causeway St. that was torn down too. Even the old Flyer Trackless Trolley's seemed to have more character. Boston itself has become much more modern and polished in the last 15 years, so I guess it makes sense that the MBTA would follow suit. It's just kind of sad that if someone was visiting from out of town, and wanted to see some cool transit-related historical items, I would only be able to think of a handful. 20 years ago, I would have been able to come up with a long list. I read on this board a few years back that the MBTA does not really have much of an interest in history, and preserving the past, which seems to be a shame since the whole system has such an interesting story. with new power in the wings,new and rebuilt bi-level cars coming online,some older cars reused on the "Cape Flyer". in some parts of the system. NOW is the time photo/video this transistion and the changes as they happen,before it is all gone! the Bay Head line went on line. who will ask about this time of change. I always admired New York transit people for having the will and appreciation of history to keep and occasionally run pieces of their antique equipment. In Boston, with the the occasional open window and regularly opened end doors, there was nothing like hearing the growling motors, clanking pick-up shoes and smelling the ozone in the subway air. Flying along the el like that was a real treat too. Guess New Yorkers appreciate that. Too bad the MBTA apparently wants none of it. I Know the MBTA is good about giving 1-2 pieces of old equipment to the Seashore trolly museum in ME. I have seen several pieces in their collection. They are trying to put some of it back into service at the museum. The MBTA just does not like to keep museum pieces directly in its collection. Finding life boring? Maybe the T could invite Senator Blumenthal (D-CT) to visit. It's nice they donate obsolete stuff to Seashore. The authentic el car experience can be had only by running them on an el or in a subway, not on a trolley ROW. But it's a moot point now as there is no el on which to run them. Guess it's the trolley tracks or nothing. It's a really interesting point. I think if I commuted daily on the rapid transit lines, I would find it boring. Compared with NYC, it's much smaller system, so you'd be seeing the same thing over and over again. As of now, I do not go into Boston with the same regularity I once did, nor do I have the time to joyride lines for pleasure, so I would say now, I'm not bored with it. I would say I'm definitely not bored with the commuter rail system, just came back from a very nice, head clearing trip to Wickford Jct. And I agree with Backshophoss's comments about the commuter rail being in transition. And with everything, we're to some degree taking things for granted. People I'm sure took steam for granted (think of the movies where real trains were used in wrecks, even one as late as 1960, Ring of Fire, destroyed an operable steam locomotive and vintage passenger coaches http://www.brian894x4.com/RingofFire.html) and I'm sure people said the same thing about first generation diesels as well. And there's some new service and stations (the Cape, Wickford Jct, Wachusett, Assembly Square, the new Government Center) as well as things down the road. But I think with me, I was 4 years old when the EL closed and Arborway service was discontinued, obviously wasn't born for A line service or the Charlestown EL) so I don't have those things to compare it with, but I can imagine I would have enjoyed those. I think it would be great if the T ran vintage equipment, and at one point, they did redo the PCC at Boylston for excursions and have had railfan excursioins. I would imagine it's a combination of 1.) management 2.) insurance higher and 3.) overall budget. I can imagine if the T wanted to sink some dough into let's say restoring the two trolleys at Boylston (and got permission of the SSTM) to run excursions. I can also imagine if certain news organisations in the area got wind of that, they'd be up in arms about the "pork." And maybe they'd have a point too, especially with the kind of debt and expenses the T has. jscola30 wrote: I think it would be great if the T ran vintage equipment, and at one point, they did redo the PCC at Boylston for excursions and have had railfan excursioins. I would imagine it's a combination of 1.) management 2.) insurance higher and 3.) overall budget. I can imagine if the T wanted to sink some dough into let's say restoring the two trolleys at Boylston (and got permission of the SSTM) to run excursions. I can also imagine if certain news organisations in the area got wind of that, they'd be up in arms about the "pork." And maybe they'd have a point too, especially with the kind of debt and expenses the T has. I think the MBTA management is just really dense. I'm sure some people would love to be able to volunteer to help fix up the vintage trolleys at Boylston. Hell, the guys at Everett found at least one junked bus behind the shops and made it like-new on their own time. The MBTA could even rent them out and charge for excursions. I really don't think there's much of a logical reason behind that not happening, so much as they're just oblivious to the possibility. I'm sure some people would love to be able to volunteer to help fix up the vintage trolleys at Boylston. Hell, the guys at Everett found at least one junked bus behind the shops and made it like-new on their own time. The MBTA could even rent them out and charge for excursions. I really don't think there's much of a logical reason behind that not happening, so much as they're just oblivious to the possibility. USDOT charter rules (49 CFR Part 604) restrict the use of such "charter" or "excursion" runs by public agencies. As for the Boylston cars, perhaps an outside nonprofit could raise the funding and provide the volunteers. These would be great for Marathon Day and Red Sox playoffs/opening day. Ditto to the 01400 work motors (if still around). Fast forward to the trips I was on in the late 1990s. 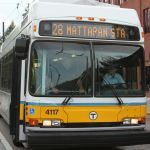 Granted Arborway and Watertown were no longer possible, all we really did was all the regular routes in regular LRVs and Type 7s, (I did one trip in 3295 in 1998 I believe) with maybe the Brattle Loop or a ride around a yard loop. I'm sure the organizers would have loved to have gone out on the Packards Corner Stub track, or pulled into the side track at Boylston. Bingo! The equipment of today is boring because it's here every day, it isn't newsworthy. Down the road when the screamers are gone and the additional HSP option has been granted numbering the days of the Geeps, today's stuff will be more interesting. When I was in high school, riding a Boeing over causeway street was no big thing, RTSs were everywhere, and pushing old turnstyles was business as usual. Not even a decade later, all that seems so long ago to those entering the scene today. Don't take what we have today for granted, because it's forever changing. We just lost our last interlocking tower, F40s are next on the chopping block, and before we're well into the next decade, single level commuter rail cars will be in the place of the German cars now. Type 7 streetcars will be the oldest in the system, painted subway cars and DC traction will no longer exist, and the last of the BERy era terminuses will be long replaced by a relocated modern structure (Lechmere). Don't take for granted what history we're holding onto. I bet those who thought Sullivan Station was a dump pre-1975 are wishing they could get it back today. What's boring is not being able to listen to the T rapid transit radio systems anymore, only can listen to T police. The only thing I can think of that is really boring is the Orangle Line replacement. Riding the El was much more interesting than the current OL ride in a trench. I miss certain things from my childhood, mostly the El, the 0600/0700 Cambridge Dorchester cars with their wooden seats, The 1924 East Boston Pullmans, the Watertown Line. OTOH, we now have the Braintree and Alewife extensions, a variety of newer equipment, commuter rail extensions to places only dreamed of years ago such as Greenbush and Wickford. I have to say that if I was a regular commuter rather than a railfan I might not favor some of those "interesting" things such as the aforementioned hard wooden seats in un-air conditioned cars in the summer. I might prefer a "boring" system. The Framingham line is quite boring (and underutilized) without freight and denuded of it's telegraph poles. The CR passenger equipment is pretty boring and less comfortable than single level trains with 2+2 reversible seats. The way the T scrapped the PCC cars, LRV's, RDC's and the EL was just plain wasteful. Why does the T do these things? High labor costs, inadequate storage space, short-sighted decision making, expecting federal govt. to pay for replacements, and the T being insolvent. Lack of innovation is also boring. The case for new diesel engines is compelling. I fundamentally don't understand why passenger coaches, trolleys and subway cars aren't cheaper to rebuild almost forever than buying new ones for multimillion dollars each.